Given that they were just about to portray a defiant band of up-the-establishment bohemians, and given that theater depends on the suspension of disbelief, maybe it wasn’t a great idea for the cast of “Rent’’ to applaud so enthusiastically on opening night when a top executive at New Repertory Theatre thanked corporate sponsor Bank of America in pre-performance remarks. But actors gotta eat, and neither that momentary episode of cognitive dissonance nor the recurrent “Bzzzt!’’ from a balky sound system over the next couple of hours managed to undermine what turned out to be a strong and spirited production. Under the sure-handed direction of Benjamin Evett, this “Rent’’ navigates that fine line between the heart-on-its-sleeve earnestness essential to the success of this 1996 musical and the melodramatic excess that perpetually threatens to capsize it. It helps enormously that New Rep mainstay Aimee Doherty, playing a narcissistic performance artist named Maureen, leaps so uninhibitedly at the chance to showcase her comic chops. John Ambrosino also excels as Mark, an aspiring filmmaker who is both participant in and observer of the action among a tightknit group of free spirits in the East Village who are trying to find what happiness they can in the middle of the AIDS epidemic. The story behind “Rent’’ has entered showbiz lore and become nearly as well-known as the musical itself: How Jonathan Larson labored for years to craft a rock ’n’ roll version of Puccini’s “La Bohème,’’ only to die at age 35 of an aortic aneurysm just hours after the show’s final dress rehearsal. So Larson never saw how huge a hit his musical became: the Tony Awards and the Pulitzer Prize; the 12-year run on Broadway; the fanatical young devotees who called themselves “Rentheads’’; the boost to the careers of such cast members as Idina Menzel, Taye Diggs, and Jesse L. Martin; the inevitable film version; the way “Rent’’ carved out a niche as a generational and cultural touchstone. As with “Hair,’’ its spiritual forebear, the story line of “Rent’’ is more impressionistic than linear. 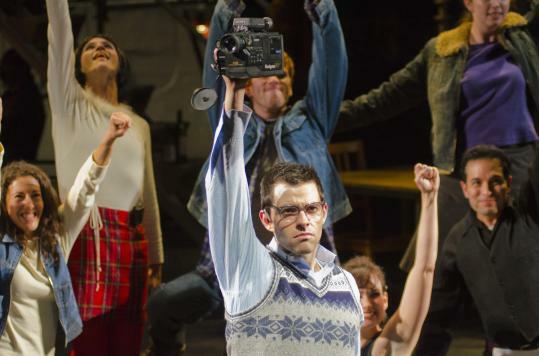 Like “Hair’’ director Diane Paulus, Evett tries to amp up the electricity by sending his cast into the aisles, but most of the action takes place on Kathryn Kawecki’s gray, two-level industrial set. Gentrification is in the air, bringing the threat of eviction to Mark and his guitar-playing roommate, Roger (Robert St. Laurence), who is HIV-positive and is being drawn, bit by bit, into a romance with Mimi (Eve Kagan), an exotic dancer and drug addict who is also HIV-positive. Their first encounter, in the duet “Light My Candle,’’ doesn’t cast the usual spell, largely because Kagan’s delicate vocals are overwhelmed by the band. A relationship is also developing between Tom Collins (Maurice E. Parent), a computer whiz who dreams of getting out of New York once and for all and opening a restaurant in Santa Fe, and Angel (Nick Sulfaro), a sweet-natured, cross-dressing street drummer. Parent and Sulfaro endow this love affair with plausibility and poignancy. New Rep’s “Rent’’ doesn’t really hit its stride, though, until midway through Act 1, with “Tango: Maureen,’’ wherein Mark and Joanne (an excellent Robin Long), Maureen’s new lover, amusingly bewail their shared frustration and bafflement at her erratic and egocentric ways. The subject of their fulminations is barely seen until near the end of Act 1, but Maureen proves worth waiting for: In “Over the Moon,’’ Doherty takes the audience on that very journey. Her parody of performance art is a miniature tour de force of comedic invention. During a wrenching rendition of “La Vie Boheme/I Should Tell You,’’ the friends celebrate the bohemian life they’ve chosen and the joyfully subversive idea of “being an us - for once - instead of a them.’’ Before “Rent’’ is over, though, the ache of loss will hit them hard and remind the audience of how many have been lost to AIDS - and of the dangers of complacency. The headlines still tell a sobering tale: Just a few weeks ago federal officials announced that 50,000 new cases of HIV infection have been diagnosed in the United States each year for the past decade. Ezra Pound said literature is news that stays news. In that sense, “Rent’’ has stayed news. But there’s another, perhaps unexpected layer of resonance to this musical today that Larson could not have anticipated. When “Rent’’ premiered in the booming, go-go 1990s, the title song, with its half-angry, half-desperate refrain about housing and money woes - “How we gonna pay?’’ - registered as the cry of impoverished and marginalized outsiders. In 2011, amid rampant foreclosures and a still-reeling economy, those margins are getting more crowded by the day, and the bohemians’ insistent refrain could almost serve as the new national mantra. Musical direction, Todd C. Gordon. Choreography, Kelli Edwards. Sets, Kathryn Kawecki. Lights, John R. Malinowski. Costumes, Frances Nelson McSherry.